Do you want to get rid of all the piled up old furniture and other unwanted stuff which is overtaking your backyard? Get in touch with us and you will get a free quote from SATSU Ltd. – the top preferred company for rubbish removals in London and the area. Don’t waste another minute, and call SATSU Ltd. now, to get the best and completely free offer for taking care of any unwanted items and rubbish in your home, office, building site or other property. Dial 020 3746 6887 or use the online form. We have been serving the residents, businesses and builders in London for more than 10 years. Our company is one of the top preferred professional clearance and waste disposal enterprises in the region, because of our well-trained and fully vetted employees, the promptness and efficiency of the booking process and of the services provided. 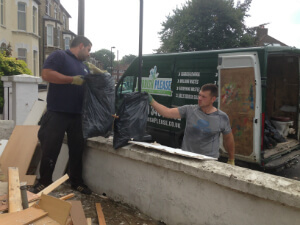 We offer different rubbish removal options to guarantee our customers’ full satisfaction. Household clearance and rubbish removals – You can book a full or partial clearance of a home, garage, loft, shed, garden or any other domestic property. The waste will be loaded without leaving a mess, and will be taken to the nearest disposal site. All items will be recycled. You can get rid of old furniture or small appliances too. Commercial clearance and rubbish removals – The professional rubbish removal service offers efficient clearance of offices, warehouses, shops and other commercial properties. It can load and dispose of any unwanted items, including IT products, tyres, furniture and others. Construction clearance and waste removal service – You can hire the professionals from the rubbish removal company to clean out a construction or reconstruction site, and take care to dispose of the construction waste safely and ecologically. We don’t handle hazardous materials, such as: asbestos, chemicals, paints or medical products as well as any foods. The good news is that you don’t even need to be at the site when the clearance and loading are being done. An employee will come and pick up a key from you and return it once the job is completed. So, if you are in need of a trusted waste disposal and clearance company in London which can give you the best price, and get to work as soon as possible, just call the customer care service at 020 3746 6887 or use the online booking form to ask for a free viewing or direct booking of a service. Booking can be done at any time of the day or night. No deposit or other advance payment is necessary. The payment is made after the job is completed. Same day booking is available. Many discounts are offered for booking combined services as well as for regular customers. Call 020 3746 6887 or fill out the online booking form now to book your clearance and rubbish disposal. It is time to get your property cleaned out and free from all the unwanted stuff!